5 Things Your Bed Bug Exterminator Won’t Tell You, and hope you don’t ask! This infested curtain was missed during inspection! Bed bug exterminators are often called in as a last resort, when the infestation has grown out of control, and the home owner is beginning to panic, and most vulnerable. At this point, most people don’t ask the hard questions or bother reading the contract and just figure hiring a professional will solve the problem – NOT so fast! Professional pest control is not cheap and it’s assumed the result is guaranteed, but the truth is you would be hard pressed to find any company that guarantees successful elimination of bed bugs. In fact, you’ll likely find yourself signing a contract guaranteeing that nothing is guaranteed, even your health! So I’ve listed the 5 things your bed bug exterminator won’t tell you and would rather you not ask. 1. You’ll do the hard part! Did you think that hiring a pest control company would make this easy on you? Think again! You are expected to do all the prep-work before the exterminator gets there, and every follow-up treatment, and you’ll sign an agreement that you did everything on this pre-treatment list (it’s not small!). If the bed bugs come back after all the treatments, the company usually points to you missing a step. The exterminator treating your home may not be a qualified professional, and they are not easy to find. Some technicians may not have the required training to recognize infestations. Always make sure you check the technician’s qualifications. These bugs can go many months without feeding and hide in places you wouldn’t think of, such as electrical outlets, TV’s, and even in places like this lady’s nose (that’s scary!). Even when the professional knows where to spray, it doesn’t mean he got all of them or that one didn’t hatch and move to another location. Make sure they’ll come back at no cost if you still spot them them a few days later. 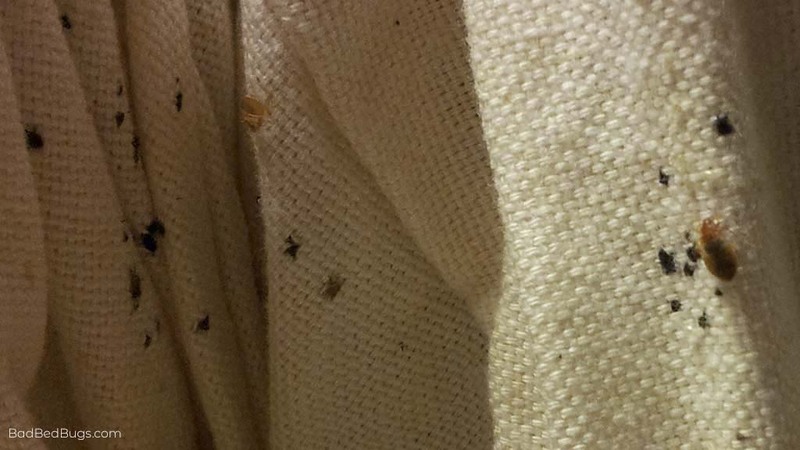 If the technician decides your mattress may be infected, you could be required to use their bug proof mattress cover. Being forced to spend $150 for something that should cost $40 is wrong. Same with the bags used to store cloths. What you want, is a company that allows you to buy your own with their approval. All mattresses and box springs must be placed upright against the wall. Take apart the bed frame, remove the headboard, and place against the wall. All shelves must be cleared of any objects. Clothing must be removed and placed in zip-lock or sealable plastic bags. Separate washable from non washable items. Non washable items to be taken to the dry cleaners and clearly mark for the cleaner to know and deal with the problem. Dry cleaners must be advised that they may not reuse the plastic bags the clothing was brought in. Include everything! Empty all dresser and night stand drawers and remove drawer from dresser or night stand. Place all treated sealed bags in an area that does not require treatment. Place sofa on its side so pest control technician can have access to the under area of the sofa. Remove Electrical wall plates and make sure nothing is plugged into outlets. Remove all items from the base of the closets and place in sealed bag. Remove all lose items from the floor and all items must be moved 12 inches away from the baseboards, including toys, etc. This includes both the basement and attic as well. Washable toys are to be handled in the same manner as clothing. Remove all paintings, mirrors, and wall accessories from walls. Remove all sheets, blankets, mattress covers and pillowcases from all beds, wash in HOT water (over 120 degrees F.) at HIGH heat setting. After cleaning place in new plastic bags and do not put them back on the bed until the evening after receiving pest control service. Wash or dryclean all pillows. Vacuum the floors, drapes, baseboards. Vacuum cleared closets, shelves, drawers, etc. Be sure to remove the vacuum bag outside, tape it shut and place it in the dumpster. Wash all clothing in HOT water and tumble dry at least 10 minutes on HIGH setting. Place all clean clothing in NEW sealable plastic bags…do not reuse the plastic bags used to collect the clothing prior to washing. Why hire an exterminator if you have to do all this work and there’s no guarantee on successful treatment? Good question, and one we see asked a lot; the best answer I can give would be that if you don’t have the time and patience to find and treat the bed bugs yourself, or if you’re okay with having potentially harmful chemicals sprayed in your home, then a professional may be the answer (even though you’ll still be doing a lot of prep work). On the flip side, good exterminators are in a tough spot… They treat everywhere and do everything right only to have the customer bring in more bugs and then blame them for a failed treatment. A good company will be completely transparent, make time to discuss the pro’s and con’s of the treatment process, and provide you a price structure before treatment begins. If they claim you can’t talk to others about the price they quoted, then I’d find another company! You can get rid of them yourself and we have enough success stories on this site to prove it; however, if you choose to hire an exterminator, then do so knowing what you are getting into!